Patti Porter has been a caring, supportive, creative, loving, thoughtful and devoted friend and supporter of the Pearsall family and Jack's PACT over the years. She sadly passed away this week surrounded by her loving family. There are infinite people who will deeply miss her. She touched many lives in the work she did at North Falmouth Elementary School, both with students, their families, but also the staff there who all loved her. 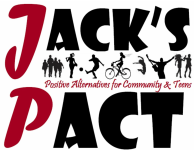 Patti's amazing children and family continue to demonstrate Patti's commitment to kids in our community and how much she also valued recovery and substance abuse prevention by graciously having donations sent in her name to Jack's PACT in lieu of flowers. Jack's PACT does not have an online donation portal. Please make checks payable to FALMOUTH TOGETHER WE CAN, INC (the 501c3 we operate under) and include Patti's name in the memo for a special account for a project for Patti within Jack's PACT. Please mail checks to Jack's PACT, PO Box 232 Falmouth MA 02541. All donations will be properly acknowledged with letters to the family indicating the memorial donations as well. All donations are tax-deductible to the fullest extent of the law.